Works has started at the 15th THI Building project: 27 Eccleston Street. In this post I look back at how a late Georgian house almost became a twentieth century department store. 7 & 9 Leyland Street - Project Complete! The two smallest THI building grant projects are now complete! Here are the before and after details of 7 & 9 Leyland Street. 46 Eccleston Street: Project Complete! Another THI Building Project is complete: Girls On Top aka 46 Eccleston Street. This post summarises the work done and shows the before and after photos. The THI has put twelve heritage plaques around Prescot town centre. This blog post gives a background to this plus a link to download the map showing the locations of all twelve plaques. 35-39 Eccleston Street: Project Complete! Another THI Building Project has completed to the extent that the vacant shop is about to open as a restaurant. This post is a run-through of the works carried out to 35-39 Eccleston Street. The THI-funded work at 35-39 Eccleston Street is almost finished. This blog post is a look at the building’s history and architecture. The diggers are in. The hoardings are up. The regeneration of Market Place is happening. This blog takes a quick look at how we’ve got to this stage and the behind the scenes work that has gone into this scheme. The not-so-unlucky 13th THI Building project – 46 Eccleston Street – is now on site, so as usual at this stage of a building project, I take a look back at the building’s history and heritage value and some of the practical conservation issues that are faced ‘on the job’. DON’T STOP THE PRESS! What a news week for Prescot! Prescot made it to the front page of the New York Times! Where do we go from here…? Help shape the heritage initiative by taking part in consultations, or celebrate Prescot's history at events taking place throughout the project. Schools and colleges can also get hands-on with the past through activities and workshops for groups. Historic buildings need people with the right knowledge to look after them. The THI will give people in and entering the local construction industry the opportunity to gain new skills and experience. The THI will also help people find out more about careers in heritage. Keep up-to-date by following us on twitter or find out more at 'Space to Create', the THI information centre on Eccleston Street. You can also contact Owen Barton, THI Officer, by phone on 0151 443 2757 or by emailing owen.barton@knowsley.gov.uk. Owners of certain buildings in the Prescot Conservation Area can apply for grants to repair, restore and re-use their property. Eligible properties are marked in red and orange. Read the guide to applying for grants (PDF) and eligibility criteria (PDF) documents for detailed information about grants. 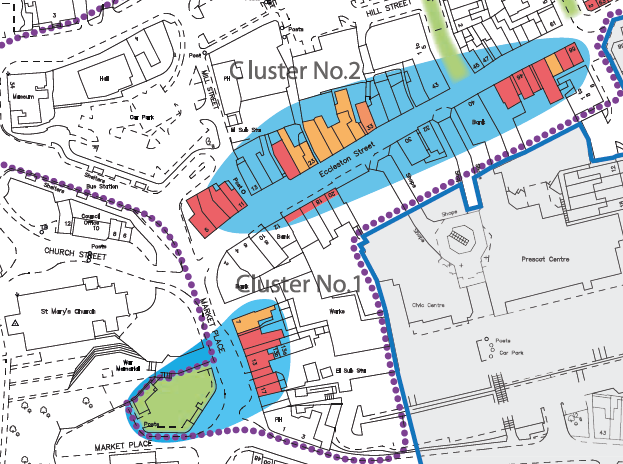 The conservation area appraisal (PDF) is a detailed assessment of Prescot's most historic areas. The appraisal appendices (PDF) contain more detailed information and the management plan (PDF) outlines how the area will be managed.